Like the fluid conversations and lengthy lunches that spill over to merienda and even dinnertime at fiestas, family reunions and intimate home gatherings, the pursuit of pinpointing the true identity of Filipino food seems endless. The country’s cuisine has been shaped by a number of factors, such as diverse foreign influences from the Malays and the Spanish to the Americans and the Chinese, as well as the varied cultures, traditions, and socio-economic circumstances in every region. But while a lot of inspiration comes from their colonizers, occupiers and immigrants, Pinoys are ingenious cooks who have created—and continue to create—fresh, flavorful dishes out of borrowed recipes, each with an undeniable Filipino twist that may be attributed to indigenous cooking techniques, homegrown ingredients, or family kitchen secrets. But there’s so much more to Filipino food that makes it extraordinary, and one cannot simply sum it up in a paragraph, in an article, or in a single book. If one wants to learn what makes food truly Filipino, he must ask not one, not two, but every Pinoy he encounters. Who could speak with greater authority on the subject than Filipinos themselves? 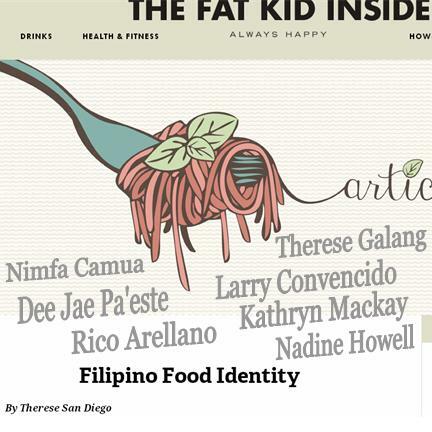 I myself got curious about what they would say about Filipino food identity, so I gathered some insights from a few bona fide Pinoy food enthusiasts. Five of them work with some of the country’s finest restaurants. One is the man behind what is probably the most popular street food stall in Manila, which has been around for nearly three decades. Another is an adventurous food lover who whips up the most heartwarming meals for her family and friends. The common thread that runs through them is their delight for what the Philippines has to offer their eager palates day after day. Read the interviews and the rest of the article on The Fat Kid Inside. Big thanks to Nimfa Camua, Dee Jae Pa'este, Rico Arellano, Therese Galang, Lauro "Mang Larry" Convencido, Jr., Kathryn Mackay and Nadine Howell for their contributions to this post!